We hope you all are doing well. We digitize the our designs in Native EMB format which need to be converted in other formats like DST before final use. Going forward DST files have no color information so it uses default colors in various shades. To work with DST files, you will need to print a color chart (or production worksheet) from your digitizing software and have that handy when you load thread on the machine. You would assign needles and load the colors according to the color chart you have at hand. To avoid this problem we are back with a new features of color chart. From now onward all the designs will be uploaded with color chart and other details. So you can easily download the color chart from our website and can have use the same identical color shown on the website. You will find the color charts and other details just beneath the image of the designs as "PDF FILE"
Further, we believe on the perfection rather than the quantity. We always try to upload the quality designs with all information. 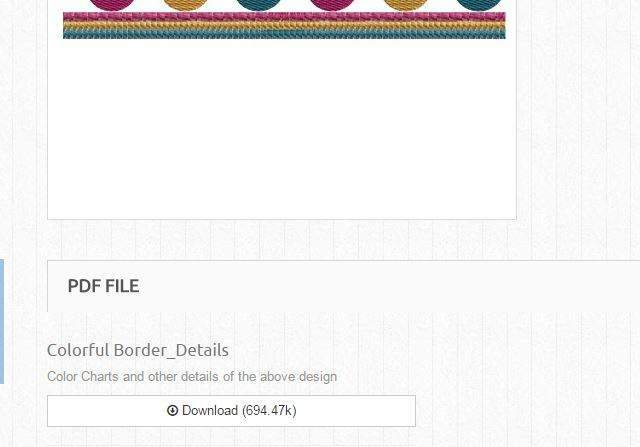 So now you can easily go through the details information of the designs before making mind of purchasing the designs. Yes the color chart and other details are available with out login to your account. At last, we always wish to hear from you. If you have any suggestion or query then feel free to contact us.